The Little Sisters of the Poor and residents of Holy Family Residence celebrated the arrival of a new postulant at a special Mass, on Saturday, Oct. 7, the feast day of Our Lady of the Rosary, in the chapel at Holy Family Residence, 2500 Adams Ave., Scranton. The postulant, Alana Beddoe, 30, of Ottowa, Canada, worked as a registered nurse at a hospital near her home prior to entering religious life. Following the Mass, which was attended by 19 of Beddoe’s relatives and friends from Canada, Beddoe assisted the Sisters in their work at Holy Family Residence for a week and then traveled to the Sisters’ home is Baltimore to begin her formation studies. First Row: Sister Theresa Michel, l.s.p. ; Second Row: Sister Marie Therese, l.s.p. ; Sister Mary Augustine, l.s.p. 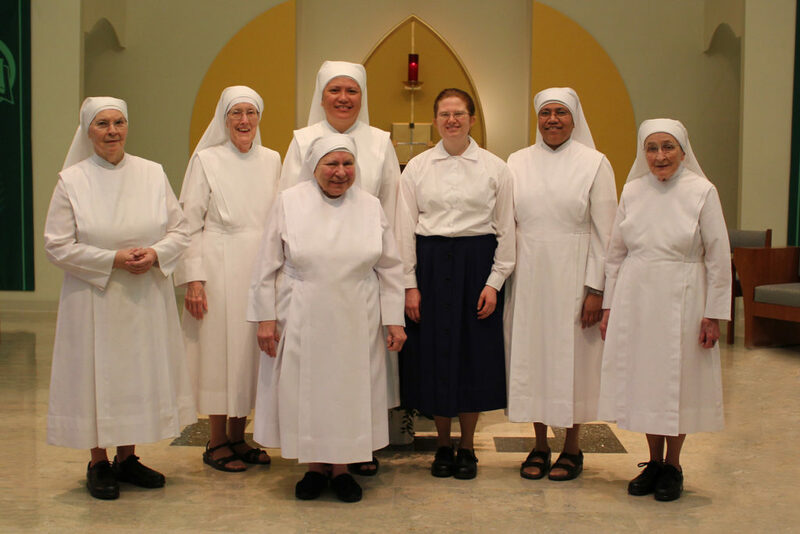 ; Sister Theresa Louisa, l.s.p., superior of the Little Sisters of the Poor’s Scranton community; Alana Beddoe, postulant; Sister Laurelliya, l.s.p., and Sister Alice, l.s.p.